Is it true that a Mantra or a Killer Tip can help one crack exams with success? Can anyone other than the individual giving the exam make such a tip list? The reality is different. It is only the person and only the person who is on the seat of a MBA entrance examinee who can best judge what can lead one to success. By playing with the best of one’s abilities one can bag their success without anybody’s intervention. It is a matter of 150 minutes which decides whether one wins or loses an entrance exam. It is recommended to study and make all last minute revisions done when it comes to sitting on that MBA entrance exam. “The harder the conflict, the more glorious the triumph.” –Thomas Prince. The basic trick that works on all exams is to beat up that inherent nervousness one has and sugar coat it boldly with an overdose of positivity and courage. There are two kinds of people. One who wait for their luck to strike them. And the other half who take actions at the present time to change the course of their future. This applies to almost everything in life, even cracking entrance exams for MBA. By simply taking care of crucial factors like managing time, monitoring speed and being accurate on that answer sheet one can crack the dream degree of the lifetime. Effectively done this can change one’s entire life. Time, speed and accuracy are that killer combination which can give one success in passing the exam. One must be able to handle their nerves when inside the examination hall and balance these three components well. This article will give some useful tips and suggestions which can be highly beneficial to the last minute preparations. Ask any MBA topper, one will get the same tip that the trick to crack that difficult entrance is to manage time efficiently. One has the freedom to move to and fro between sections and come back to the questions any time they want. So, if a questions seems challenging one can hold it and complete the one’s one is absolutely sure about. One must keep a close tab on that clock. One must attempt to answer all questions. It’s true it is not at all a child’s play to answer these but with so many challenging mock tests when practiced on a regular basis one usually gets used to it. A smooth speed in answering questions in a MBA entrance exam helps one be safe. Speed and confidence is inter related in this situation. 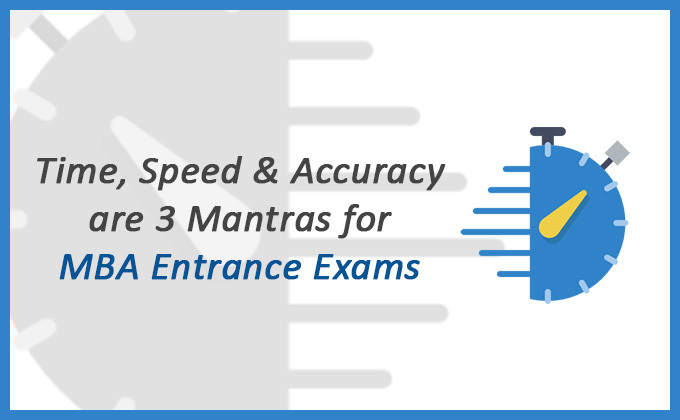 Initially when one sits on the entrance exam with the question paper in hand one tries to attempt the answers they know the best with a decent speed. Solving the easiest questions first quickly gives one confidence. Confidence is the primary weapon or tool while giving any examination. By moving from the easiest to the most difficult is best way to speed up the work. Every thought, every dream and every strategy begins in the mind first. Similarly when sitting for the MBA entrance exams one must be accurate first on their mind. By being sure about what to write in the mind one must then ink it down on the paper. It is important to read the questions multiple times in a calm mind and understand. Once the intricacy of the questions is accurately understood then the job is half accomplished. It is important to know that a negative answer fetches negative marks in a MBA entrance. Hence, one must be accurate on their answering. It is true that success never comes by opting short cuts. It has its own criteria of hard work and success that one needs to fulfil to satisfy it and it is then when one achieves it. It is practice beyond everything that can help one keep time, speed and accuracy all in hand while in that examination hall. If one is serious about this exam then it is better to act like one.